Our feature movie of the week is Speech & Debate, the screen version of the stage play. The film follows three teenagers (Solomon, Diwata & Howie) brought together by a series of mishaps. Frustrated by the hypocrisy they see in their parents, teachers, and the entire school board, the unlikely trio set out to find a common truth and make their voices heard through Speech & Debate club. Recently staged in London (and starring Douglas Booth as Howie, Grand Budapest Hotel’s Tony Revolori as Solomon, and Patsy Ferran), the film version expands the play’s small cast with more characters. The trio are faced with the chance to expose their drama teacher, accused of preying on teen boys. 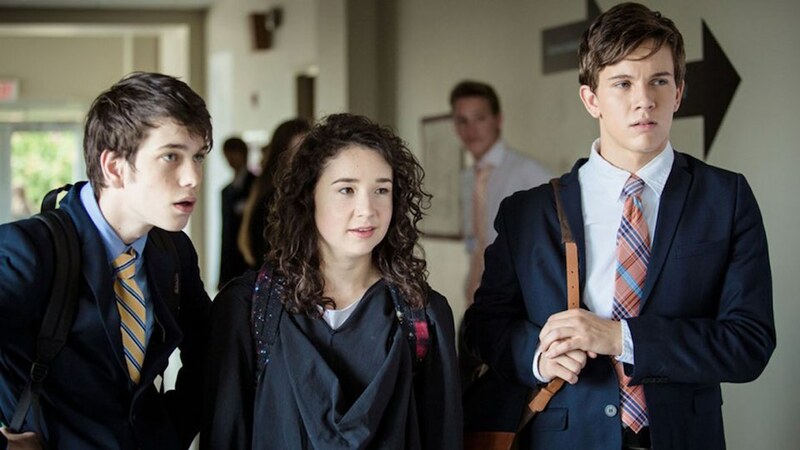 Solomon (Liam James), reports for the school newspaper and is finding faculty resistance trying to get a hard-hitting piece published, Diwata (Sarah Steele) is an aspiring actress with little talent and a podcast where she vents her frustration with being cut from the school play, and Howie (Austin P. McKenzie) is a gay teen solicited online by the same drama teacher. Howie’s under-attended gay-straight-alliance is thrust together with the lone member of the Speech & Debate club, Diwata, and together they convince Solomon to give their club the minimum numbers so that they can together over-come the censorship and hypocrisy. Also starring Roger Bart, Kal Penn, Wendi McLendon-Covey, Janeane Garofalo, Skylar Astin, and a wonderful performance by Lin-Manuel Miranda as the Genie.